Tesla's new electric semi truck is unveiled during a presentation in Hawthorne, Calif., on Thursday. Tesla Inc.'s Semi is headed for the grocery stores in the backyard of the Detroit 3. Meijer Inc. has reserved four Semi trucks for US$5,000 deposits apiece, Dan Scherer, a fleet manager for the Grand Rapids, Mich., retailer, said at the unveiling of the Semi Thursday near Los Angeles. He said the closely held company operates 220 trucks in six states in the Midwest. "Electric drivetrains are a proven technology," Scherer said. "Electricity is cheaper fuel than diesel, and you are less dependent on the spot pricing of fossil fuel." Walmart plans to order 15 Tesla trucks, five for the United States and ten for Canada, as part of a study of the technology. "We believe we can learn how this technology performs within our supply chain, as well as how it could help us meet some of our long-term sustainability goals, such as lowering emissions,” the retailer said in a statement. J.B. Hunt Transport Services Inc. said on Friday it also placed a reservation to purchase the Semi. Tesla said on Thursday that Semi production would begin in 2019. "Reserving Tesla trucks marks an important step in our efforts to implement industry-changing technology," said John Roberts, CEO of J.B. Hunt. The Lowell, Ark., logistics company said it will deploy the trucks on the West Coast. 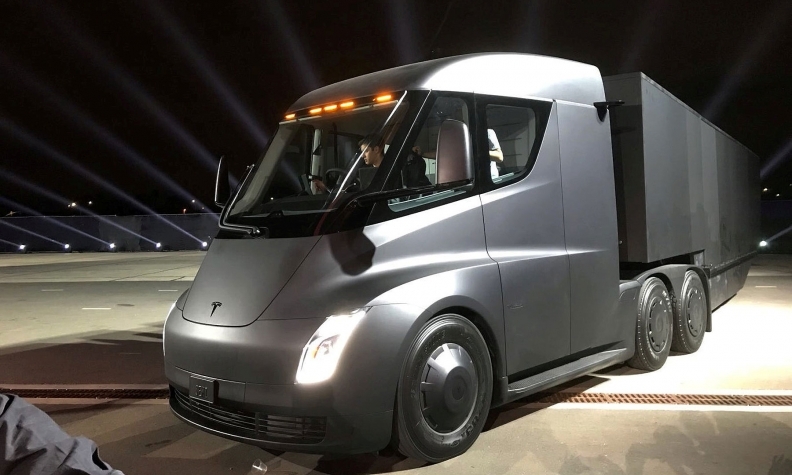 Tesla has to convince the trucking community that it can build an affordable electric big rig with the range and cargo capacity to compete with relatively low-cost, time-tested diesel trucks. The heavy batteries eat into the weight of cargo an electric truck can haul. The Semi can go up to 500 miles (800 km) at maximum weight at highway speed, Tesla CEO Elon Musk said, without giving the size of the payload. Musk said the Class 8 vehicle, the heaviest weight classification for trucks, in 30 minutes can recharge the battery enough to go 400 miles (640 km), and that Tesla would build a global, solar-powered network of "megachargers." Old Dominion Freight Line Inc, the nation's fourth-largest, less-than-truckload carrier, and other carriers appeared more cautious in weighing electric trucks. "Carriers have been skeptical about the heavy-duty tractor applicability to their models, given questions regarding torque, total hauling capacity, and recharging infrastructure," said Benjamin Hartford, a sector analyst with brokerage Baird. "We expect other carriers to follow as electric tractor viability becomes proven." A spokesman for United Parcel Service Inc. said the giant courier had nothing to announce regarding Tesla's truck but would always look for options that fit its needs. Brad Pinchuk, CEO of Dubuque, Iowa-based Hirschbach Motor Lines, said the trucking firm was looking to test non-diesel, big-rig options but needed longer ranges than Tesla could provide and speedier fuel-up times. Pinchuk said he plans to buy two hydrogen-powered trucks made by Salt Lake City-based electric Nikola Motor Co. when they are available in 2020. "It’s a different application – putting liquid hydrogen into tanks – so it will be very similar sort of situation to diesel," Pinchuk said. "You’d be able to fuel up. It would take about the same amount of time to fuel up a diesel and go about the same distance."